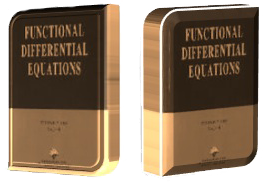 Journal “Functional Differential Equations” is destined for the publication of high quality mathematical papers in the area of functional differential equations. Emphasis are placed on important developments in abstract and applied functional differential equations involving boundary value problems, optimization and control theory, stability theory, oscillation and nonoscillation, variational problems, differential equations with impulses, integro-differential equations, difference and functional equations, theory of partial and ordinary differential equations. Journal “Functional Differential Equations” is only one in the world where the theory of these equations is the main area of the journal. The refereeing is done by anonymous reviewers. Only scientific quality of the papers were the criterion for publication. The refereeing is done by anonymous reviewers. Only scientific quality of the papers were the criterion for publication. Journal “Functional Differential Equations” is only one in the world where the theory of these equations is the main area of the journal. The journal was established by Professor Michael Drakhlin in Ariel University in 1993.